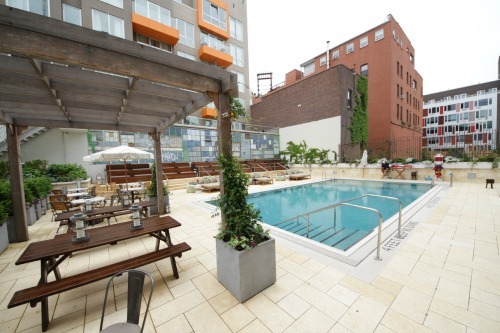 New York City hotels with pools are pretty rare, and a special treat for any local or visitor. Poolside at a hotel will likely conjure the image of a resort, beach balls being thrown and kids playing…but NOT in NYC! Our hotel pools are mostly adult party zones with skyline views, cocktails, private cabanas and summer long pool parties, depending on the day of the week. We do have a few pools that are family-friendly, and/or designed for your exercise laps, so keep reading to learn more about which NYC hotel pool is right for you and your family. For locals looking for a staycation, many of the hotels offer pool and spa day passes, so you can "escape" the city for a day while you relax and recharge. 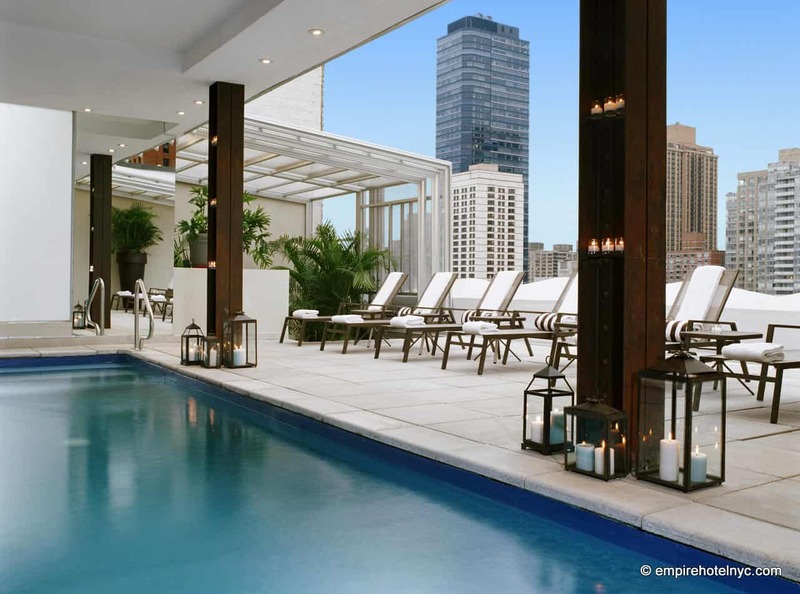 The Royalton Park Avenue, in a great NYC location, offers a hip and trendy year-round indoor/outdoor heated pool with a perfect view of the Empire State Building, complemented by two floors of adjacent bars and lounges. 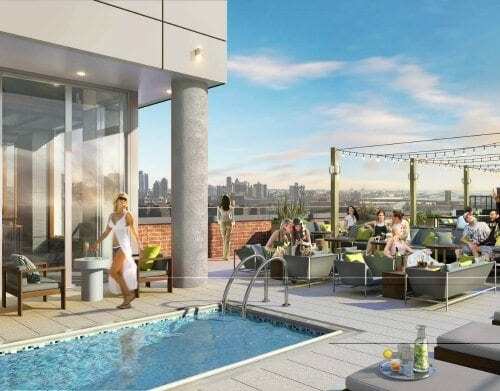 The Hotel Gansevoort Meatpacking pool has a retractable roof, with indoor winter and outdoor summer swimming, both connected to the popular Plunge Rooftop Lounge, also indoors and outdoors. The view from the Gansevoort Meatpacking rooftop is one of my favorites, stretching across to NJ and all the way uptown. A trendy hotel, in one of the City’s hippest neighborhoods, the Hotel Indigo rooftop pool is definitely more for the party scene than those interested in doing laps. 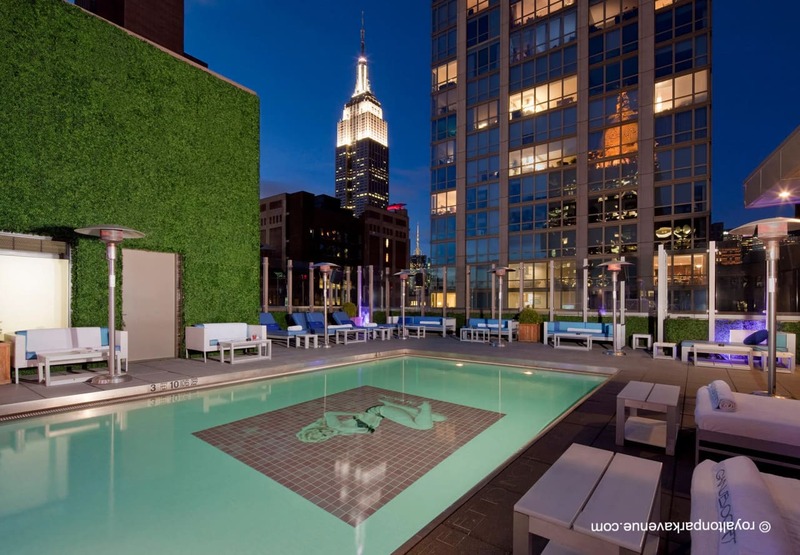 Enjoy sweeping NYC views from most rooms, and on the rooftop, while you sip a cocktail outside, dine at Mr. Purple or take a dip in the outdoor, heated pool. 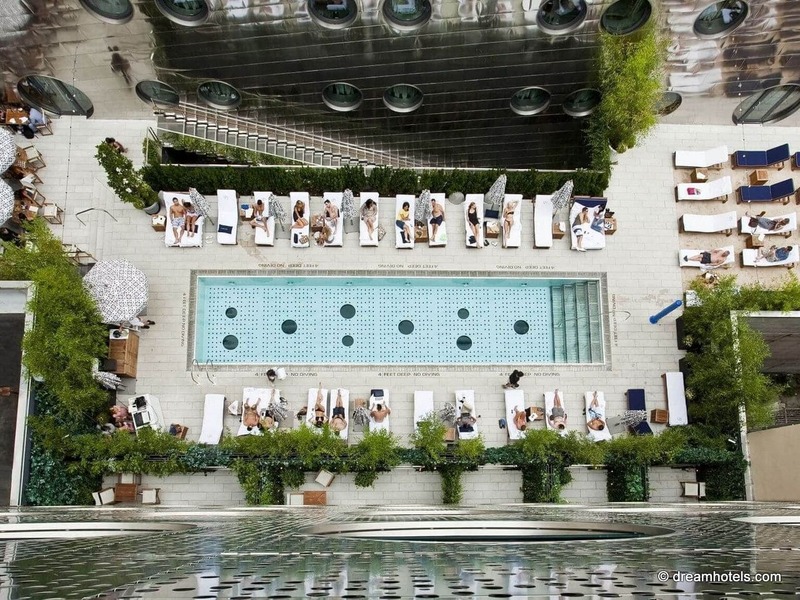 Yet another hip & trendy hotel pool in NYC, the Beach at Dream Downtown, a pool surrounded by sand, is a partier’s dream and consistently filled with private parties, models, tourists and locals. The Dream Downtown was once the National Maritime Union headquarters, and maintains its maritime theme by looking like a ship from the outside and windows like portholes. 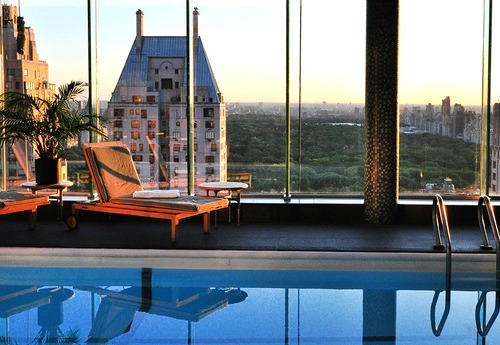 The family-friendly Le Parker Meridien lets you swim ‘on top of the world,’ in their 40-foot-long pool on the 42nd floor, with panoramic Central Park views. The indoor pool has floor-to-ceiling windows and is complimented by an outdoor sundeck and full menu of bites and drinks. They also have a fantastic spa, Gravity gym, racquetball and basketball courts. For a local ‘staycation,’ check out their day pass and/or summer membership options. The Peninsula’s glass-enclosed swimming pool boasts sleek décor that features striking floor-to-ceiling teak columns set against a cool black tile floor. Poolside dining is also available, featuring healthy and delicious dishes. Daily aqua aerobics classes help keep guests fit while on the road. 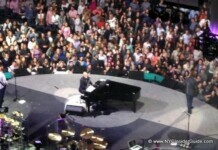 Children welcome when accompanied by an adult. Located in Lincoln Center, guest quarters at the Empire Hotel offer earthy décor, leather furnishings, satellite television, room service, wireless Internet, and work stations. There is an onsite restaurant, cocktail bar and casual lounge, business and conference facilities, a rooftop swimming pool with Cabana Rentals (May-September), spa services, and a fitness center. The The Watson Hotel (formerly the Holiday Inn) on 57th Street, a 600-room property 2 blocks from Central Park, consistently gets rave reviews given its value for the price. A recent reviewer says, "I give it 5 stars not because it’s a 5 star hotel, but because it delivered exactly what I expected for a little over $200/night…" Their family-friendly 10th floor rooftop outdoor-only pool is open all summer and offers a swim up wet bar with cocktails and appetizers. 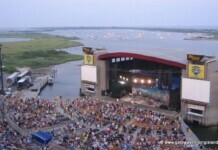 For locals, day passes are available. An urban retreat in downtown Manhattan, Bar d’Eau is located on the 7th floor of the Trump SoHo Hotel featuring a 6,000-square-foot outdoor pool deck with lounge chairs and seating. In the evening, Bar d’Eau is open to the public, adding a glamorous outdoor cocktail lounge option to SoHo’s trendy nightlife scene. Bar d’Eau light fare and cocktails are served from 11am to 11pm. 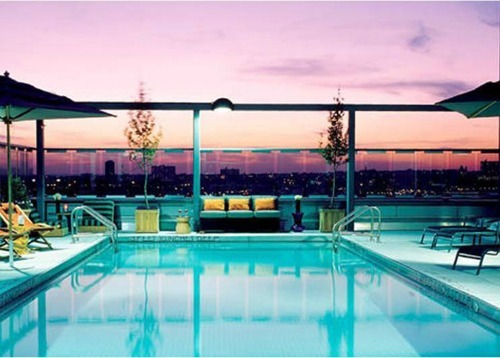 The McCarren Hotel & Pool, located in the center of Williamsburg, Brooklyn, offers 64 rooms with a modern vibe, a rooftop overlooking McCarren Park, amazing skyline views of Manhattan, a huge three-season saltwater pool, plenty of daybeds for suntanning and a poolside menu with lite bites and cocktails. Day passes for non-guests are very reasonably priced and go on sale 24 hours prior to the day of access. 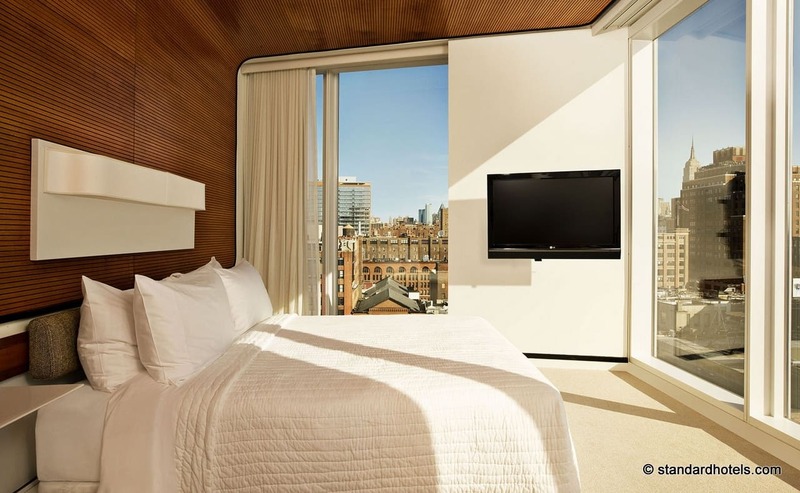 Interested in more hip NYC Hotels? Check out one of our NYC Hotel Rooftops, which offer cocktails and food, views, pools, cabanas, sundecks and retractable roofs. Some of them are open only to hotel guests, so if you want a spectacular skyline view and maybe a private party built in to your NYC stay, check out one of our Best New York City Hotel Rooftops.